A visitor insurance plan must be chosen based on the nature of the trip. Type of coverage that is required for a leisure, business or extreme activity trip varies from one another. There must be provisions for needed coverage in the chosen plan. For example, if a traveler is going to participate in extreme sport activities like snowboarding, bungee jumping, etc., his plan must offer extra coverage to cover risks associated with these sports. Similarly, if a traveler is suffering from acute onset of pre-existing conditions, he must chose a plan which covers the tragic or sudden occurrence of these conditions. A plan which does not provide enough and required coverage based on the nature of the trip and visitor’s needs, is as good as no plan. Visitors purchasing visitor insurance plans are charged on the basis of their trip duration, age of the traveler, type of coverage, overall policy maximum and the type of plan. Of course cost is a consideration which can’t be missed. But it should be remembered that a plan with low-premium may not be sufficient according to a traveler’s needs. It sometimes happens that in an event of medical emergency the traveler might end up paying a lot from his pocket. So, visitors must seek a balance between the cost and the needed coverage. Besides, the nature of the plan and its inclusions, the choice of typeof plan is also very important consideration. Whether a visitor chooses a fixed coverage plan Vs. Comprehensive is a very relevant question. One offers low premium benefit whereas the other offers adequate coverage benefits. This should definitely be discussed with an experienced agent. The terms, in-network and out-of-network are one of the most used and talked about words while choosing a healthcare provider in case of a medical emergency/event. Insurance companies have contracts with medical providers (doctors, hospitals, diagnostic labs, pharmacies). This contract between the insurance company and the medical providers provides services at discounted rates to the insured persons. As well it is also easy to avail a service, because of this contract. This is in-network. Whereas, the out-of-network means visiting a medical provider who has no contract with your insurance provider, hence no discounts are available. While choosing a visitor insurance plan, it is therefore very useful to choose a company that has an excellent provider network. The network information (the doctors, hospitals) are available on the website. Sometimes situations may arise when the trip has to be postponed or cut short. In that case, visitor insurance policy has to be either extended or have to be cancelled for some amount of time period. The renewability and cancellation feature is a useful and flexible feature to have in a plan. A visitor should think about it and accordingly make a choice. The mode to renew and cancel is also important, normally it is easier to just call/email to avail renewability as well as cancellation services. Whether a plan offers for addition of extra coverage riders can also be an important question while making the choice of a plan. This may depend on the travel requirements. 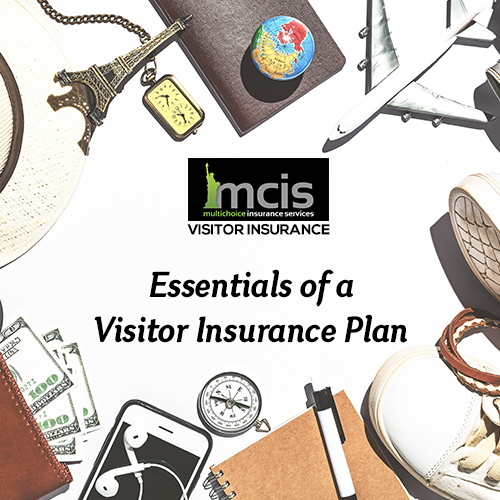 For more information and details about these essentials of visitor insurance and it’s buying process, call MCIS today. We are easy to contact, via email or phone. Please enter the following information to get Quotes and Compare Best Visitor Insurance Plans.